I signed a contract, am I stuck? If I fire the attorney, am I breaking the contract? Earlier this month, a state appellate court released an opinion in a Georgia dog bite lawsuit discussing the element of causation, as well as the type of evidence that a plaintiff must present to establish liability against an out-of-possession landlord. Ultimately, the court determined that the plaintiff failed to present any evidence indicating that her injuries were a foreseeable result of the defendant landlord’s negligence actions. According to the court’s written opinion, the plaintiff was on a walk with her dogs a few blocks from her home when two pit bulls approached her. The approaching dogs initially began to quarrel with the plaintiff’s dogs, but when the plaintiff tried to separate the animals one of the large dogs knocked her to the ground and began to attack her. Thankfully, a passerby called the police, and officers were able to stop the attack. However, the plaintiff sustained serious injuries as a result of the attack. The plaintiff filed a personal injury lawsuit against the dogs’ owners. However, the plaintiff later added the landlord as an additional defendant, claiming that the landlord was negligent in failing to keep his property safe. This case involves the plaintiff’s case against the landlord. Who is Going to Pay When the Are Multiple Vehicles in the Crash? Determining liability in a Georgia car accident may seem to be a straightforward endeavor, and in some situations, that may be the case. However, when an accident involves multiple vehicles, establishing which parties are at fault and which parties are entitled to recover for their injuries can be a bit more complex. 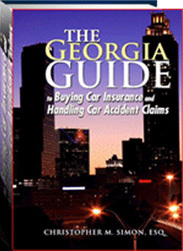 To help judges and juries divvy up liability in Georgia multi-vehicle accident cases, courts use the comparative fault model contained in Georgia Code § 51-12-33. Under Georgia’s comparative fault model, any accident victim who is less than 50% at fault for causing an accident is able to recover for their injuries. However, in determining the appropriate amount of damages, the court will reduce the plaintiff’s damages award by their own percentage of fault. For example, if a motorist sustained $500,000 in injuries but was determined to be 10% at fault, the motorist’s total recovery amount would be $450,000 (the total figure of $500,000 less 10%). Section 51-12-33 helps courts deal with other issues that can arise in a situation involving several potentially liable parties. For example, like the situation where a plaintiff is partly at fault, each defendant will be assigned a percentage of fault and will be responsible for their own share of the damages. This is regardless of whether there are other potentially at-fault parties that were not named in the lawsuit, for whatever reason. Additionally, a defendant cannot be held liable for amounts in excess of their own share, in the event that one of the other at-fault parties is unable to compensate a plaintiff. In other words, defendants will not be held jointly liable. Last month, the Supreme Court of Georgia issued an interesting and important opinion in a Georgia product liability case that changed the way lower courts will analyze food-poisoning cases in the future. Although the appeals court allowed the case to proceed to trial, the evidence connecting the caterer to the poisoning is weak and will likely fail at trial. WHAT MAKES A WORKABLE FOOD POISONING CASE? You start with the eternal question of “so what?” If the harm was just vomiting and a trip to the ER, ask for the ER bill to be paid and move on. Yes they may be responsible, but life goes on and they certainly did not intend it. If you have a hospital admission or anything more serious, then there is a point to moving to the analysis of what caused it. In order to carry a strong case, the hospital needs to take a stool sample to determine the kind of food poisoning and the particular strain. That data can then be compared to the source food to conclusively show what caused it. Food poisoning usually take 2.5-4 hours to set in, so if it happens quickly, it’s likely not from that meal. The case dealt with the burden a Georgia food poisoning plaintiff has to meet in a defense motion for summary judgment. Ultimately, the court concluded that Georgia food poisoning plaintiffs should be held to no higher a standard than any other plaintiff who brings a case based on a theory of negligence. The plaintiffs were a man and woman who became violently ill after consuming food that had been prepared by the defendant caterer at a wedding rehearsal dinner. The defendant filed a motion for summary judgment, challenging the plaintiffs’ case on the basis of causation. Essentially, the caterer claimed that the plaintiffs were “unable to show that their alleged food poisoning was proximately caused by defendant.” In support of this argument, the caterer pointed to the fact that the plaintiffs ate food from numerous other places in between the time they consumed the defendant’s food and the time they became ill. Additionally, the defendant argued the fact that none of the defendant’s employees, the event staff employees, or the other rehearsal dinner guests became ill after eating the food. The county where you bring a car accident lawsuit, the venue, can have as much of an impact on the value of the case as anything else. When analyzing value and making decisions about where to file the lawsuit, you really have to weigh your options carefully. One excellent example of how tricky this can be is a recent opinion, a state appellate court discussed a case that stemmed from a Georgia hit-and-accident. The case presented the court with the opportunity to discuss how the general procedural rules governing which venue is appropriate fit together with the more specific venue-selection rules contained in the state’s uninsured motorist (UIM) statute. Ultimately, the court concluded that the specific venue-selection language in the UIM statute should be given effect over the more generally applicable rule. Thus, the court dismissed the defendant’s appeal. The plaintiffs were injured after the defendant rear-ended the vehicle in which they were riding. Immediately prior to the accident, an unknown “John Doe” driver cut off the plaintiff’s vehicle, requiring the plaintiff driving the car to slam on the brakes to avoid rear-ending him. After the plaintiff slammed on the brakes, the defendant crashed into the back of their car, and the John Doe driver sped away. He was never located. The plaintiffs filed a personal injury lawsuit against both John Doe as well as the named defendant. Renting a car with Turo, does my auto insurance cover me? Many of you are trying out the convenience of the car rental-ish entity, Turo, which allows you to rent people’s private vehicles much in the same way that Airbnb does for houses. One of the key questions is, what if you rent a Turo car and get into a car accident and damage another car or hurt someone? I scheduled a trip for Labor Day to San Francisco and one of my all time goals was to rent a hot car and drive the Pacific Coast Highway and the Napa and Sonomo Valleys. I got on Turo and found a perfect 2018 Black Jag F-Type convertible for a reasonable $200 a day. Throw in a few taxes etc and then you come to a buy insurance screen. Turo pretty much tells you they have no idea if your car insurance will cover you and suggests you buy a “spot” policy that covers you while driving. This policy is written by Liberty Mutual and comes in either $30,000 in liability coverage or $1,000,000 of liability coverage. The larger policy costs $81 dollars a day! Once you factor this in, the rental rate looks a lot less attractive. I started poking around. First I checked with American Express, which normally provides coverage for property damage done to rental cars so you don’t have to buy that from Enterprise or Hertz or whatever. Nope, Amex says right on their website “we do not consider Turo to be a car rental company” and therefore their coverage does not apply.